“(Sept. 8) ON GUARD DUTY FOR THE LORD-This U.S. gun crew places its trust in the Lord but not the enemy as Pvt. 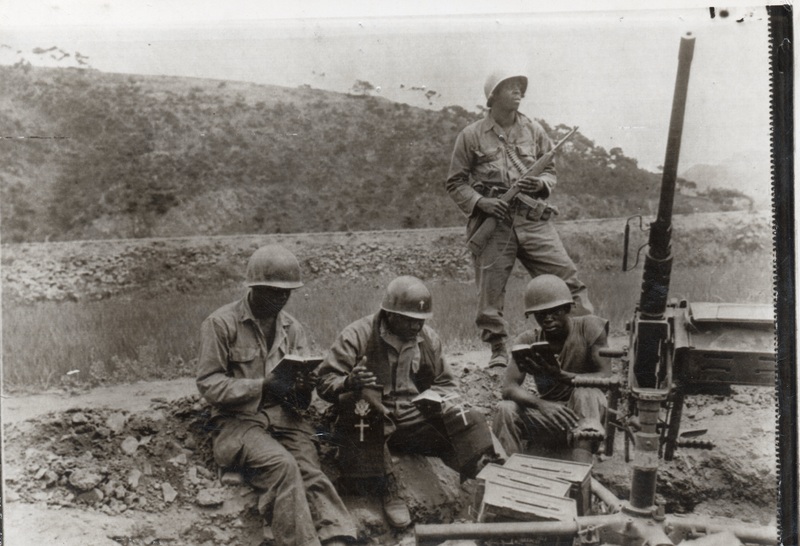 James McCadney, Long Island City, N.Y., stands guard over remote outpost on Korean front while chaplain, Lt. Col. John A. Deveaux, Jacksonville, Fla., conducts church service. Reading religious books are Pfc. O. B. Williams (left), Montgomery, Ala., and Pfc. Archie McEachin, Washington, D.C…50” (author’s collection). Chaplain Leo Peter Craig, O.P. (1913-1951), was killed while serving as an Army Chaplain in Korea. 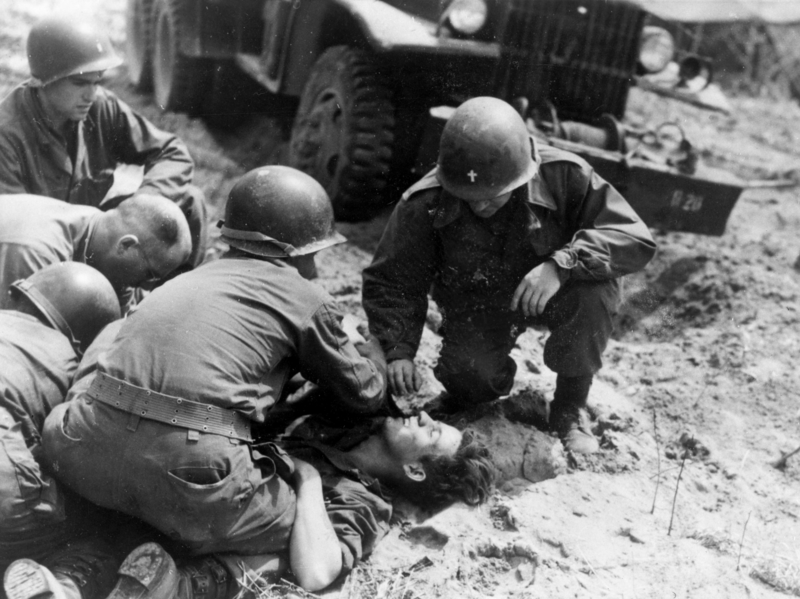 In this picture, taken moments before his death, Chaplain Craig is seen anointing a soldier who had been severely injured by a land mine. 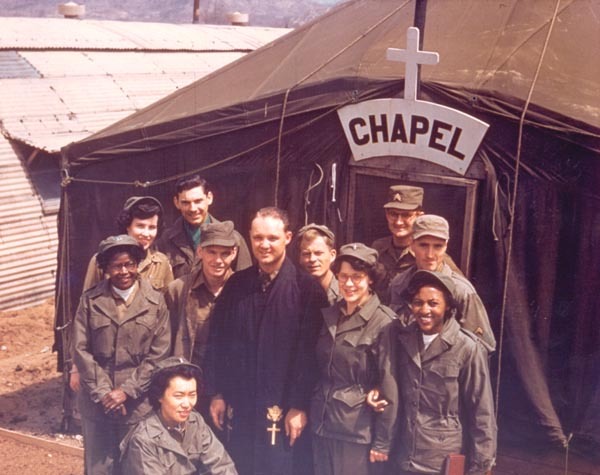 Protestant choir- ANC’s, MP’s, and engineers, chaplain 1Lt Hinkledey (Lutheran), 11th Evacuation Hospital, Wonju, Korea 1951-52. 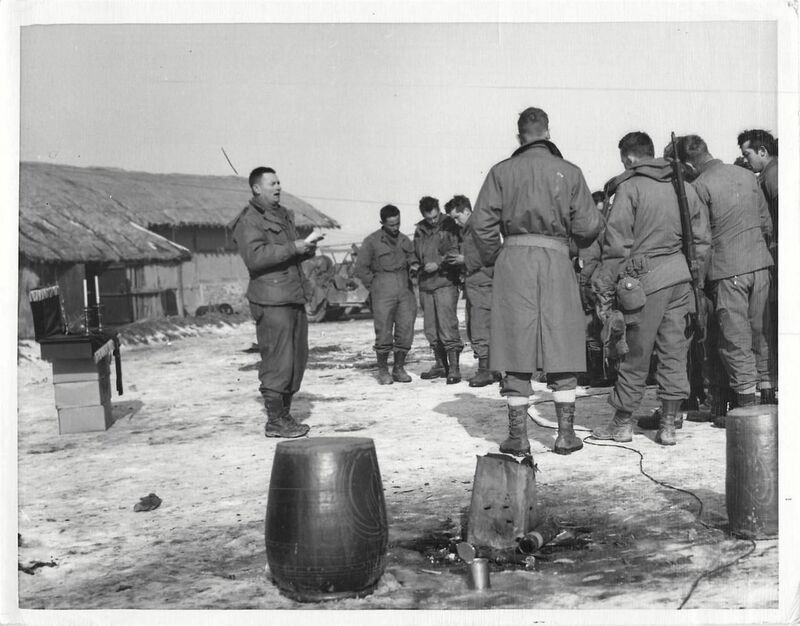 Unidentified Protestant chaplain leading a worship service in Korea in 1952. 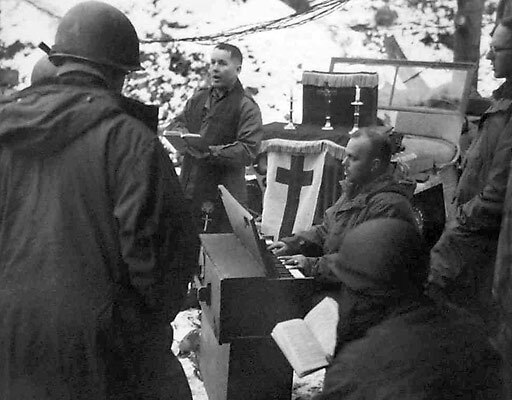 Chaplain (Captain) John A. Lindvall of Stamford, Conn., 160th Regiment, 40th U.S. Infantry Division (standing center with book), leads members of the regiment in singing during religious services held in the field. He is assisted by Cpl. Doyle W. Sullens of Victoria, Mo., organist and Bobby D. Conner (standing at tree), chaplain assistants, both of Headquarters and Headquarters Co., 160th Regt., 40th Division – January 27, 1952. 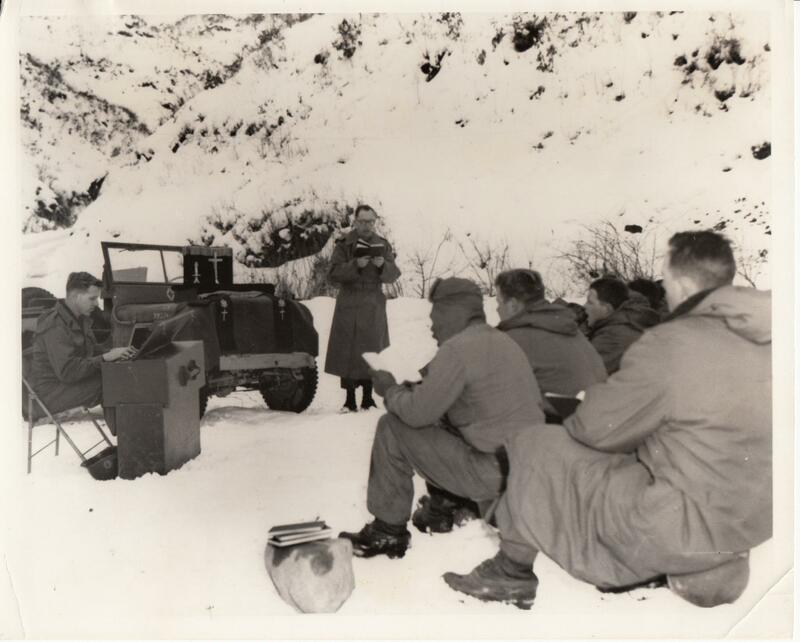 A chaplain hold services for UN troops on the western front. A military chaplain holds a young child in this photo taken by the International Committee of the Red Cross (ICRC) during the 1950-53 Korean War. “In 1951, Lieutenant James E. Norton, CHC, is hoisted onto an awaiting H-03C after holding Sunday morning Catholic services aboard the cruiser USS Newport News (CA-148), a ship designed before rotary-wing aircraft came into common use” (picture from the Hampton Roads Naval Museum website). 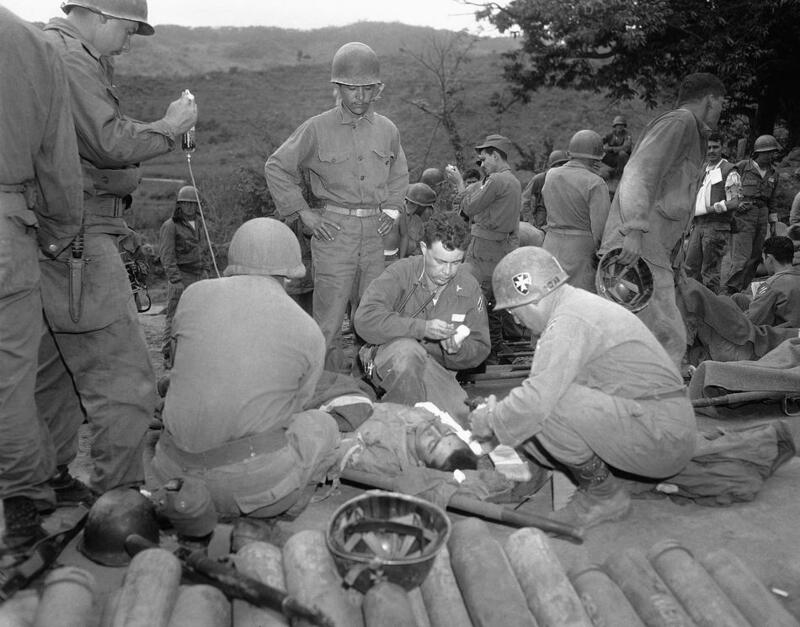 “On May 7, 1952, Lieutenant August F. Mendonsa, CHC, USNR, assisted by Corporal Alvin J. McGee, USMC, sets up an altar on sand bags in preparation for mass at the front lines in Korea. (U.S. Navy Photo by Aviation Photographer’s Mate 3rd Class H.W.H. Aring” photo from the Hampton Roads Naval Museum website). 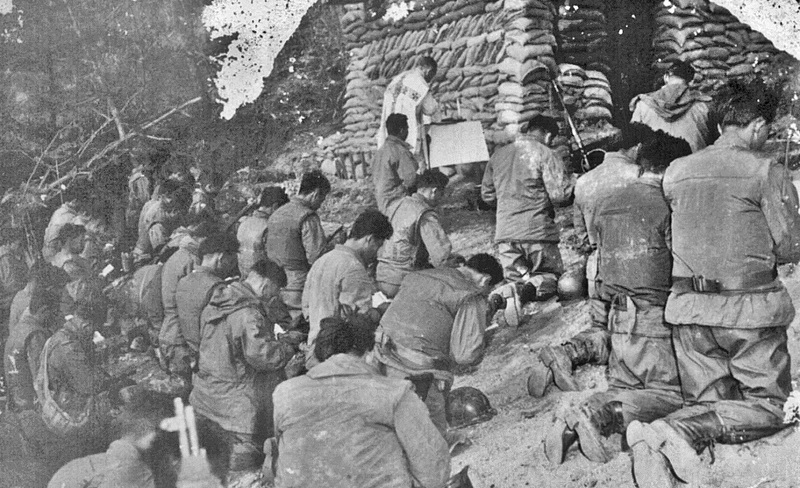 “Lieutenant August F. Mendonsa, CHC, USNR, conducts a Communion Service for a company of Marines posted on the front lines in Korea. It is likely that Mendonsa’s field altar case is at the lower left of the frame. (U.S. Navy Photo by Aviation Photographer’s Mate 3rd Class H.W.H. Aring” from the Hampton Roads Naval Museum website). “(SE13-SEPT.5) FRONT LINE SERVICES-Capt. 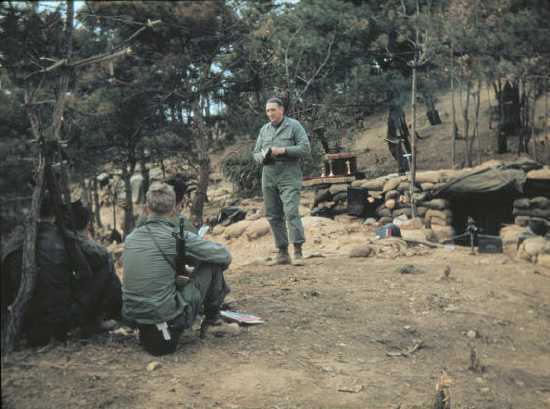 Emanuel Carlsen, Cliffside Park, N.J., chaplain of the 1st Cavalry Division’s 7th Regiment, holds church services for GI’s within sight of the front lines in Korea. Smoke rises from burning town (upper right) at end of road in background. 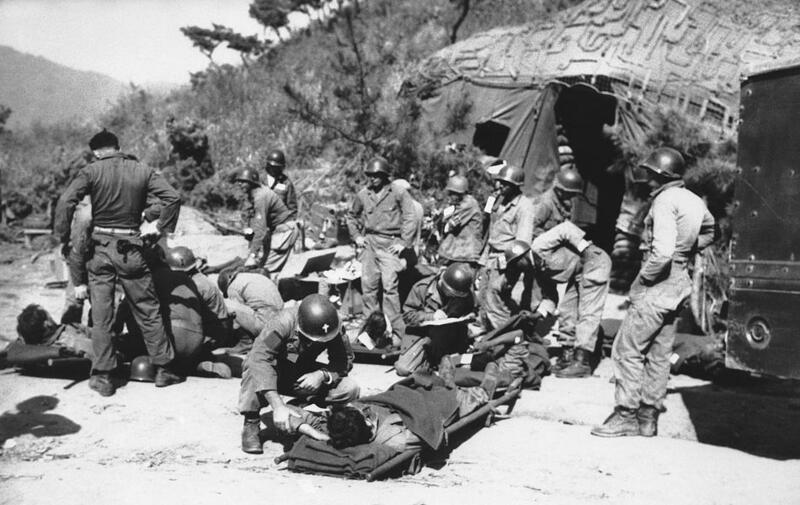 (U.S. Army Photo via AP Wire photo)(jdc3103Ousa) 1950” (author’s collection).